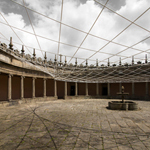 The Jury’s appraisal: The installation displays a provocative way of reinforcing the geometry of the round cloister of the Serra do Pilar Monastery, through a lightweight structure made of ropes. 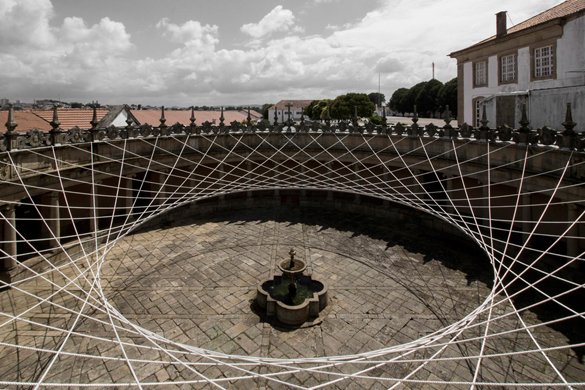 The arrangement of these ropes reduces the section of the patio until it becomes a sort of oculus, along the border of which hang the drawings being displayed. 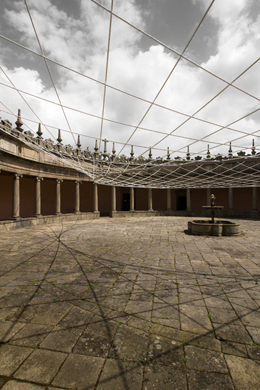 The graphic documents are suspended in the circular space, creating a smaller patio within the cloister itself. Using very few elements, this project achieves a spatial proposal with great visual strength. Le Corbusier visited Mallorca in 1932 and recorded his impressions in a notebook, today kept in the archives of the Le Corbusier Foundation in Paris: the then entitled Carnet C 10. The pages of this notebook clearly illustrate Le Corbusier’s cultural and professional interests but also feature more general thoughts on the role of design in Corbusierian thinking. Closely observing the suite of drawings made on his journey to Mallorca, we confirm that the work begins and ends with two designs of Barcelona, made on the boat, at the start and end of his journey. 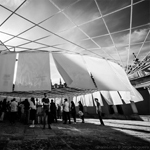 As Xavier Monteys says, “If we imagine that we gather all the sheets together one after another and join up their ends —the two drawings made on the boat— we embark on a journey without beginning or end, “a panorama”, an instrument recurrently used by Le Corbusier”. It is this idea that led to mounting an installation that would allow us to experience such a structure on a large scale, adopting the reference of the master’s drawings. It therefore seems relevant and natural that, in setting it up in the city, the circular cloister of Sierra del Pilar Monastery was chosen, one of Europe’s most notable buildings in classical architecture, erected in the 16th century in the Sierra of San Nicolás de Vila Nova, in the city of Oporto. 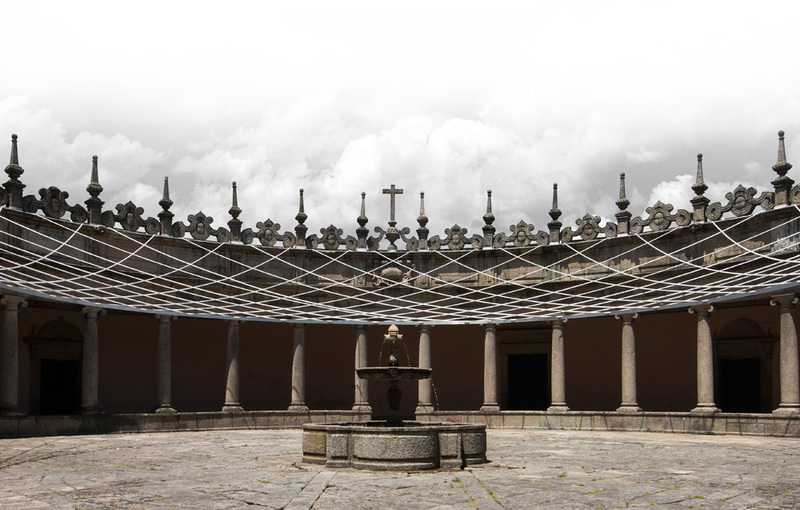 This choice was due not only to the shape of the cloister, which favours the installation of a “panorama”, but also to the coincidence between the number of its intercolumniations and the number of pages that were going to be reproduced in a large format. Almost 1000 linear metres of white cable were used, contrasting with the stone. 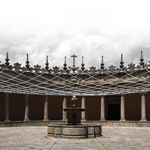 These cables configured a false star on the floor, comprised of twelve triangles starting in the geometry provided by the columns, but also by the pinnacles that occupy the roof of the ambulatory. In the hypothetical event of a surge or decrease in the intensity of the electrical power, an evaluation was conducted of the mass of the structure in relation to the mass it supported to prevent the catenary of the cables from being affected, compensating for the effect of gravity and giving a sense of lightness to what the structure was supporting. 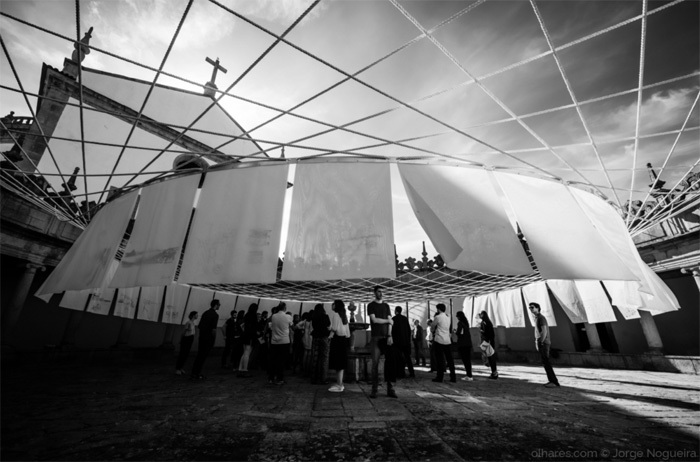 This linear structure, a vestige and memory of the framework that supported the event, then gains new life, a new amplitude and universality. It is the expression of a rite. 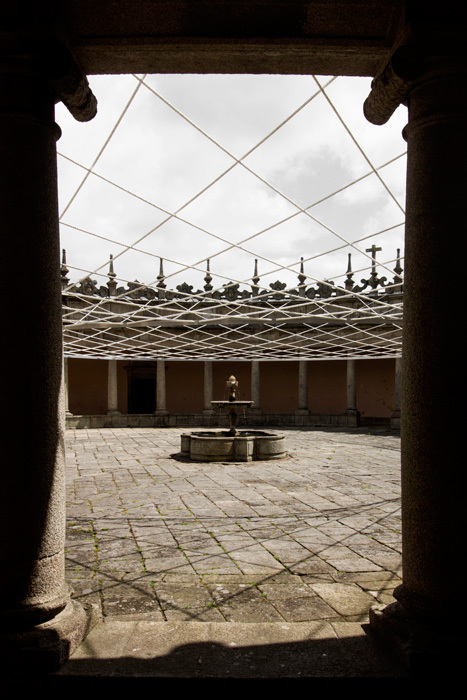 From the ambulatory to the cloister, we enter a space with a covering suggested by the cables in the manner of a threshold, a transition space between a covered exterior and an uncovered exterior to finally reach the open-air space. Localización Location: Porto, Portugal. 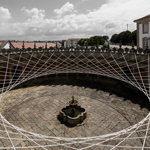 Arquitectura Architecture: Marta Sequeira, Pedro Matos Gameiro, Carlos Machado Moura, arquitectos. Colaboradores Collaborators: Paulo Dias, João Varela. Consulting Consultancy: Fernando Rodrigues - ARA. Promotor Developer: Municipio de Vila Nova de Gaia, Inscripción - Impresión gran formato, Doblado - Tecnología y Sistemas de Bend, Lankhorst Euronete Portugal. Producción/Montatje Producción/Montage: - Sign - Wide Format Printing, Curvar - Tecnología y Sistemas de Curvatura, Outside Works - Trabajos en Altura, VMZinc, Rodrigues y Proença. 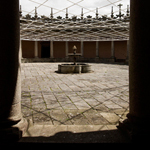 Soporte Prop: Ejército portugués, la Dirección Regional de Cultura del Norte. Fotografía Photography: Matos Gameiro Arquitectos.